A passenger jet skidded off a runway at LaGuardia Airport and crashed into a fence as it tried to land amid a blinding wintry mix Thursday morning, sparking a minor fuel leak in one of its wings, prompting evacuations and injuring several people, Port Authority officials say. 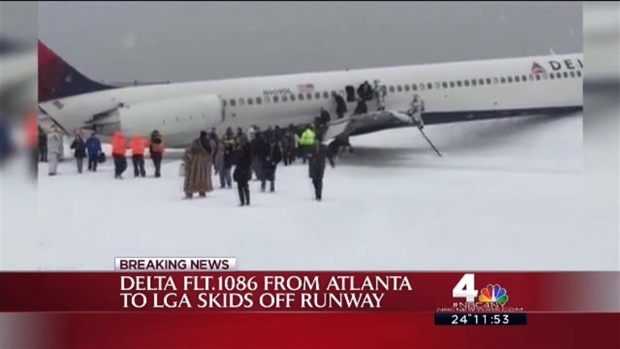 There were 127 passengers, including Giants tight end Larry Donnell, and five crew members on board Delta flight 1086, an MD-88 headed to New York from Atlanta, Georgia, when it slid off the runway around 11 a.m., authorities said. Two dozen people reported minor injuries, according to the FDNY, and three of those people were taken to the hospital. 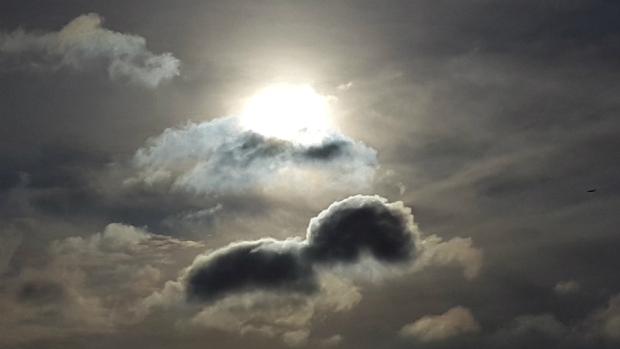 Passengers described feeling turbulence as they landed, like a rocking motion. One said the jet hit the runway and didn't slow down until it smashed into the fence, inches from the water. 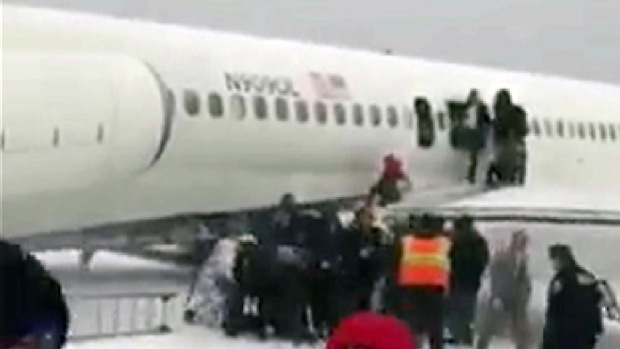 See video of evacuations of the Delta flight that skidded off a LaGuardia runway in bad weather Thursday and crashed into a fence. The impact caused a minor fuel leak on the plane's left wing, the Port Authority said. The fuel was leaking at a rate of about 1 gallon per minute, but fire crews were able to quickly stop the leak. LaGuardia's two runways were shut down immediately after the accident and the city's Office of Emergency Management said all incoming and outgoing flights had been suspended. Several LaGuardia-bound flights were diverted and nearly 900 flights were canceled. One of the runways reopened around 2 p.m., allowing air traffic to resume, though travelers were advised to check the status of their flights with their carriers. About 3 inches of snow had fallen in New York at the time of the accident, but wind, sleet and snowflakes combined to hamper visibility and make paved surfaces slippery. 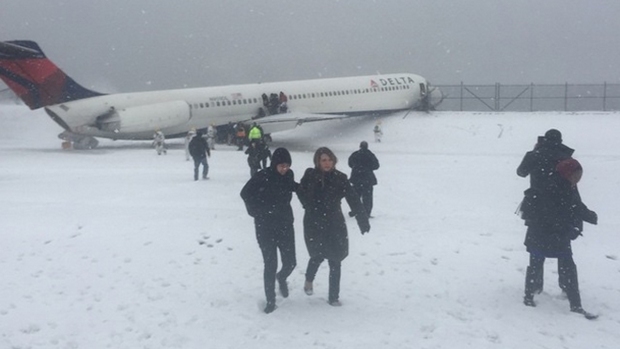 NBC 4 New York meteorologists say freezing fog was observed near LaGuardia around 11 a.m., which likely coated the already snow-topped runways with an icy glaze and may have contributed to the accident. Port Authority Executive Director Patrick Foye said that the two planes that arrived on Runway 13 before Delta 1086 landed smoothly, with pilots reporting good braking ability. Foye added that the runway was plowed shortly before the plane skidded off the runway. Aviation experts say with congested skies, along with relatively short runways and sometimes rough weather conditions, LaGuardia has a relatively solid safety record. Jonathan Dienst has a look at some past accidents and close calls for some perspective. Audio logs from LiveATC.net provide a clearer picture of the circumstances before and after the accident. About 30 minutes before the scheduled Delta flight 1086 landing, air traffic controllers are heard asking ground crews about the conditions of Runway 13. The Port Authority said it had the highest number of crews available to clear the runways at LaGuardia and keep the airport open during the snowstorm Thursday. But air trafic control transmissions show that runway conditions were constantly changing, even just minutes before Delta 1086 tried to land. According to the logs, the crews advise traffic control there is about a quarter inch of wet snow on the runway and a snow bank about a foot high. The tower repeats the conditions back. "Affirmative, and the runways have not been treated," crews respond, according to the LiveATC.net logs. "We're just grooming and plowing." The logs later capture the moment air traffic controllers try to get in touch with the flight. "Delta 1086 ... Delta 1086? Delta 1086, tower are you with me?" controllers are heard saying. The pilot does not respond, and controllers are heard over the next few minutes speaking with ever-increasing urgency as the assess the situation. "The airport is closed, the airport is closed. We have a 3-4," one voice says. "We have an aircraft off the runway. 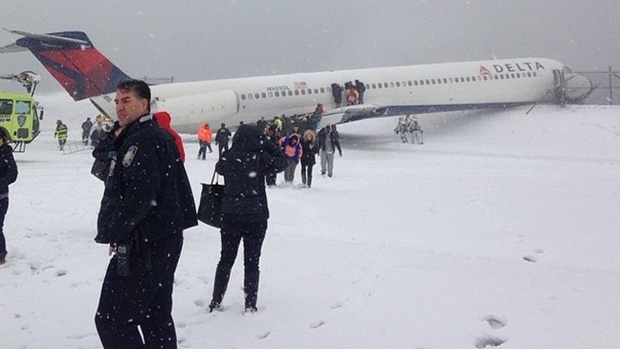 LaGuardia Airport is closed at this time." Photos posted to Twitter and other social media showed the tail of the plane dipping into the snow; the nose was pointed upward and appeared to be damaged. Other photos showed the front of the plane smashed through the fence as passengers climbed out onto a wing and trudged through snow to safety. Passenger Naquithae Jamal Taylor talks about the moment his plane skidded off a runway at LaGuardia Airprot Thursday morning. Video posted to Instagram from Donnell shows orderly exits as passengers respond to directions from officials in orange reflective vests. Donnell said later he and the other passengers were scared, but otherwise mostly OK; he said he felt "blessed." Multiple emergency crews from different agencies, federal and local, respond to the scene. The Federal Aviation Administration and the National Transportation Safety Board are investigating. In a statement, Delta said all customers deplaned safely and were transported to the terminal. "Our priority is ensuring our customers and crew members are safe," the airline said. "Delta will work with all authorities and stakeholders to look into what happened in this incident." In October, a Delta MD-88 flight from Atlanta with about 63 people on board struck the concrete pier supporting the same runway involved in Thursday's accident, and had its landing gear ripped off. The 75-ton plane skidded, 2,700 feet on its nose wheel and belly; the fuselage cleared the pier by only 16 inches, according to NTSB data. Three minor injuries were reported. A Delta plane carrying at least 130 passengers and crew skidded off the runway as it tried to land at LaGuardia Airport Thursday and crashed into a fence. Several injuries were reported and Storm Team 4 says a phenomenon known as freezing fog may have contributed to the accident. 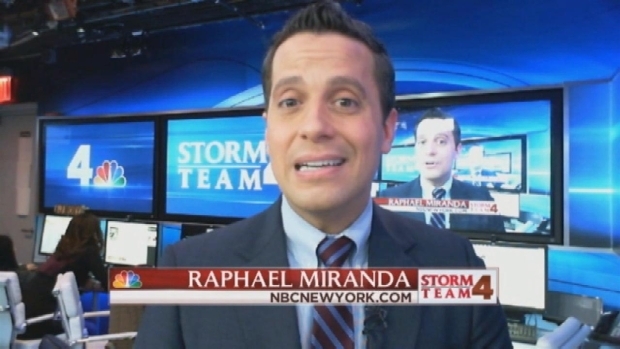 Meteorologist Raphael Miranda explains. An aircraft skidded on the runway at LaGuardia Airport and crashed into a fence as a blinding wintry mix coated the region Thursday morning.